Thanks for taking part Laura. First of all, would you tell me a little about yourself? I’m a poet, novelist, and a very amateur photographer. I live in Huntington, West Virginia, and my husband and I have three grown children. We divide our time between the beautiful mountains of West Virginia and Western Maryland. I’ve always worked for as long as I can remember. My parents were divorced, so I babysat and sold Christmas cards in grade school and junior high for extra money. My first real job was over Christmas break when I turned 16. I worked in the toy and candy departments of a Five & Dime store and then it turned into a summer job. I also worked one year in “Notions” at a big department store. I took typing in high school and got a job as soon as I graduated as a clerk-typist at The International Police Academy in Washington, D.C. My oldest brother drove me there, showed me the proper bus stops, and let me off at the YMCA. Scary! After that summer, I acted in summer stock, was a dentist’s assistant, worked as a substitute teacher, taught Lamaze, became a full-time English and Speech teacher, and was book editor for West Virginia Living magazine. I often held two jobs since I moonlighted at the community college or as an adjunct professor at Marshall University. Somehow, I managed to keep writing while working full-time and raising a family. I belonged to a poetry group called The Guyandotte Poets for a few years, and I created a draft of a poem every month to be critiqued at the meetings. Many of those poems were later published. I started keeping a journal when I was 16, and I played around with a few poems in high school. When I went to college, I wrote a poem called “The Leafman,” and it was accepted in the student literary magazine Et Cetera. I was thrilled. When I saw my poem in print for the first time, I realized that real living, breathing people might be reading it. Some even told me they liked my poem, so that was an important moment for me. My words were actually connecting with others, and I loved that feeling. I was also inspired by Cynthia Rylant, a prolific and important children’s writer. She lived in Huntington for a time, and we were friends. I witnessed her meteoric rise to fame. Another profound inspiration was the legendary author Ray Bradbury. I was/am transported each time I read and reread his work. Tell me about your journey to publication? My first love is poetry, so after a number of years of my poems being accepted in small and larger publications in the U.S and Ireland, I thought about trying to get a collection published. In 2006 that dream finally came true when Lake Effect was published by Bottom Dog Press. From start to finish, my novel The Silver Tattoo has been a long and winding journey. For a few years, I belonged to a writers’ group called The Rogues, and we were all intent on getting a novel published. I finished a rough draft in 2003 or so and started querying agents. I received early interest and after many rejections and numerous revisions, two agents were interested at the same time. I signed with Foundry Literary and Media in October 2008, and it went on submission in early 2010. After major ups and downs, heartbreak, depression, and steely determination, my novel was finally published in April 2013. Since then, I published a short story prequel to The Silver Tattoo in April 2015 called Night Terrors. April seems to be a lucky month for me! 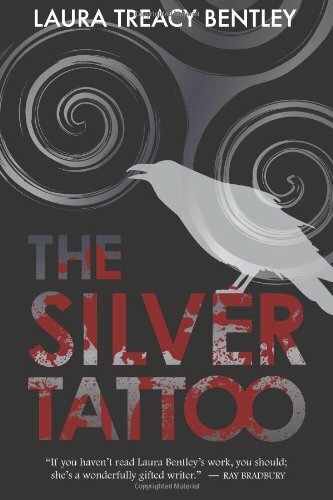 THE SILVER TATTOO chronicles the story of protagonist Leah Howland as she deserts her eerily psychic husband and flees to mythical Ireland only to become entangled in the dangerous web of a stalker who leaves her increasingly gruesome calling cards. I do. Actually, two! I’m shaping, pacing, and polishing a new novel and have just compiled my second poetry collection. I also wrote a picture book that’s on submission right now. What’s your favourite book you’ve read in the past year? Or favourite three if you really can’t choose! I loved The Miniaturist, Rebecca (I reread it and still adore it! ), The Orchardist, and Big Magic. Sorry, that’s four! I’m finishing up Gone Girl. I got sucked in by the hype and wanted to see what all the fuss was about. I am still drawn to cradle-in-your-hands paper books although I do read on my Kindle sometimes. I don’t have a pattern of reading. I can read anywhere, anytime when I have a moment, but I do love relaxing on my big red couch with a glass of pinot noir within arm’s reach. My very favourite author is Ray Bradbury, and I love Fahrenheit 451. I’ve reread it several times and always identify deeply with Clarisse, so I want to be her before she mysteriously disappeared. She’s a minor character yet Clarisse had such a major influence on Montag, and, of course, on me. She knew what was important, and what was not. She had a clear and beautiful wisdom far beyond her years. LAURA is an important author/blogger/name in the active West Virginia literary world. Thanks so much, Joanne, for featuring me on Author in the Spotlight!! I hope to return to Scotland someday. Edinburgh is simply beautiful.